My drafting table is set up under the window so I have the northern light. I have good light most of the day. I can also have my back to a wall which gives me comfort. Most of my room is set up with just such comfort in mind. I have high stools so I can sit or stand to do my work. Most of what I need in a area is at arms length mostly so I do not lose my concentration by going into another area and getting distracted. In addition to the project I am currently working on, I also think alot about friends and family and what I need to do for Soroptimist, and when a project is due, and how to schedule my time, and a myriad of other things and before I know it I have solved another design problem! Here is a tour of my studio. I finally got all my beads in one place! No small task. In the past I had beads in trays under the table, in file cabinets, in plastic tubs and in fishing tackle boxes. I now can find what I am looking for. I set the beads against the wall because I don’t want too much light hitting them. It is harder to see the color of the beads when there is too much light on them. 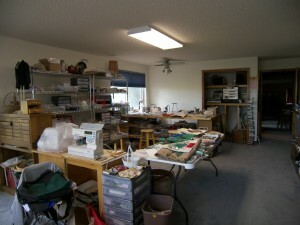 To the left of the beads are my 4 sewing machines. A woman can’t have too many machines. The table in the center picture (on the right) is where I keep my glass to be fired into jewelry and buttons. I leave it out because although I am not currently working in glass I am very visual and need the visual stimulation to help with what I am working on. 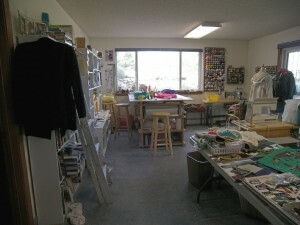 The table under the window in the back is my cutting, design, painting, do all table. 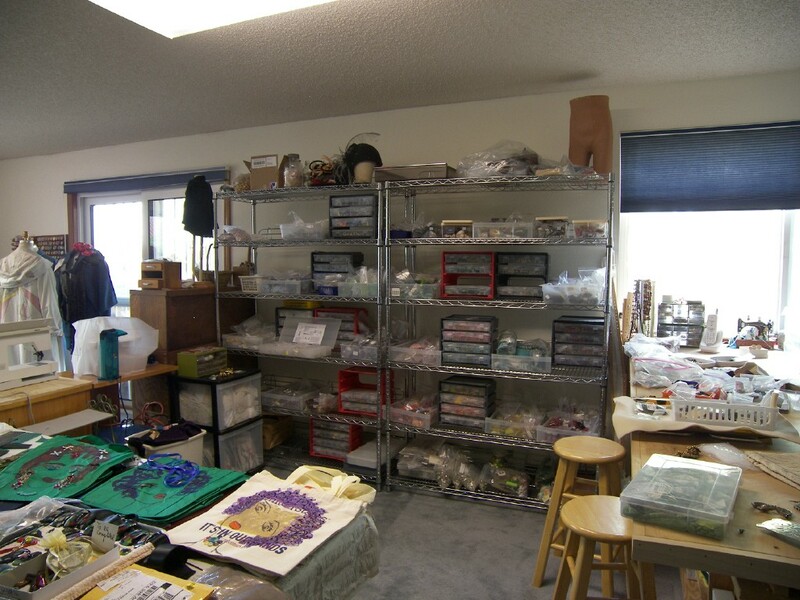 The last picture is where I have all my silversmith tools in the back left corner. I have good light and shelving under the table to store what I am not working on. I am looking forward to combining silver and beads and cabochons. The pictures of the beaded cabochons are my first work using cabs and beads. The hardest part was choosing the right colors for the beads. I finished the work with light green pearl luster beads and little gold beads. It really set the brown/cream stones off. I love working in my studio. It feels warm and safe and I get to do whatever I want in that space. Although I find that most of my ideas come to me during that time just before sleep, in my studio I get to put those ideas down with needle, thread, fabric, etc. I wish I had more time for all the ideas I have! The previous picture of my cabochons showed work in progress. This is the finished necklace. I added loops to the back of the two cabs on the top and added 15 lb. wire to string my pearls. 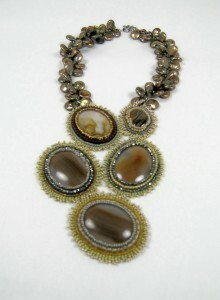 The necklace is finished with a sterling silver toggle. I hope you like it. 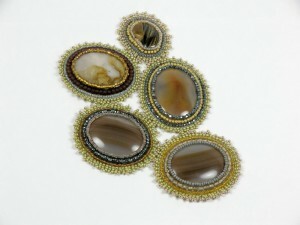 My next piece will also use cabochons but they are a lace agate in off white, gray and burgundy. Wait ’till you see it. A girl can never have too many machines!